Mike, “Bill Clinton”, joins me from the Digital Spy Forum for the first episode of this Media Horizons chat show. – The Closure of the News of the World, is it really closing? – The Apprentice, who will win? – Big Brother on Channel 5. – Is there a Digital Spy type person? Feel free to join in the discussion and if you want to be involved in the next Digital Spy discussion and anything you would like to add or say, simply email TheWorldsTalking@gmail.com. We are joined by Boards.ie members and Speartackle writers Alan (Limerick) and Peter (Wicklow). We look ahead to Ireland’s chances in the upcoming Rugby World Cup and discuss the competitive Northern and Southern Hemisphere teams looking to prove a point. Connacht Rugby gets a special mention for their place in the Heineken Cup. 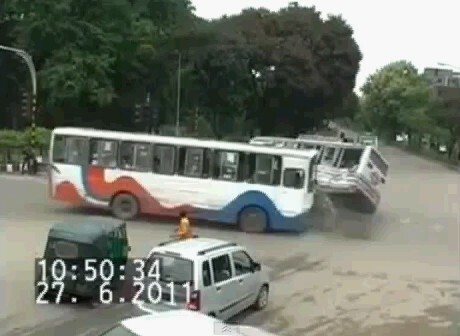 This clip highlights the need for traffic lights. Look closely and see if you can spot the small green car that appears to have escaped the sandwich.